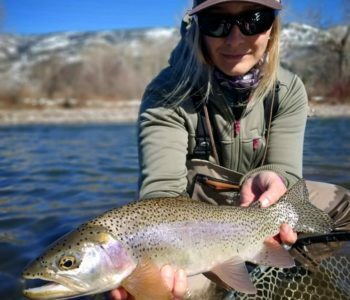 Fly-fishing has exposed Chrissy Atkins to a beautiful network of folks across the country and around the world who love nothing more than sharing their passion with others and protecting the resources they enjoy. When she first moved to Vermont, a co-worker convinced her to attend a meeting of the local Trout Unlimited chapter, where she eventually served as President and Treasurer and was able to bring friends like Jackie Kutzer into the fold. Chrissy and Jackie have been teaching classes together for years, and Chrissy loves working with her to inspire and celebrate women in fly-fishing as co-leaders of the 50/50 on the Water initiative. 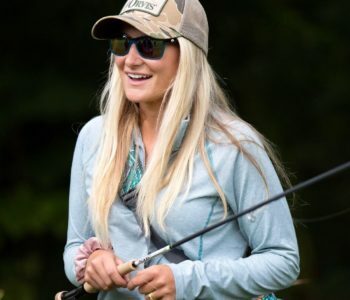 Along with their co-workers and friends, Amanda Gibson and Abbie Mahurin, they’ve formed a women’s fly-fishing group in the Northeast (a chapter of Braided), to help bring female anglers together both on and off the water. Abbie and Chrissy are also working to start a program in Vermont for the Mayfly Project to help mentor foster children through fly-fishing. (They’re looking for more mentors if you’re interested!). All of these women are at the point in their journeys where they get just as much joy out of teaching others and watching them fall in love with the sport as they do when they’re the ones holding the rod. I’ve been fishing for as long as I can remember and wanted to be a professional bass fisherman when I was a kid. That career didn’t pan out, but now I get to teach hundreds of people how to fly-fish each year. Having worked in several fly shops around the country, I’ve been able to experience many types of water and fisheries. I’m happy to live in a state that has world class fishing everywhere! 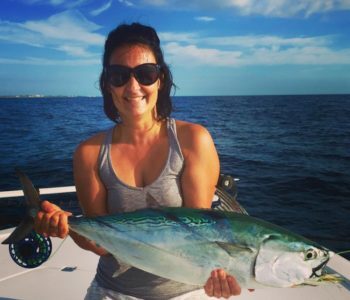 Growing up fly fishing throughout South Florida, Heather has always had a love for education and conservation. After spending this past summer helping to lead student programs at Fly Fish Guanajain Honduras, she landed her dream job: Director of Programs and Fundraising for Fish for Change, a startup International nonprofit she is helping to create. The organization’s mission is to develop sustainable student cultural-immersion programs at fly fishing lodges around the world. During the summer, high school and college kids have the opportunity to fly-fish in remote places while giving back to the environment and surrounding communities. Each program is based on unique local projects and fisheries,but they always follow the four Fish for Change pillars–Connection, Education, Conservation, and Exploration. In 2019, summer Programs will be taking place in Honduras, The Bahamas, Mexico, and Colorado. If you, or someone you know, may benefit from one of the programs and are interested in getting involved, visit fishforchange.org. 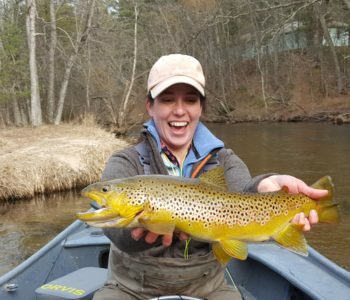 Kelly E. Buchta is a relentless and enthusiastic volunteer who dedicates her time and passion to organizing, leading, and fostering diversity in the fly-fishing world. 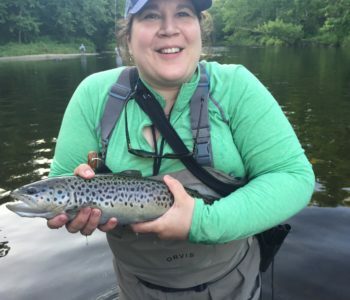 She is the New Jersey representative to the Trout Unlimited National Leadership Council, as well as the Northeast Regional VP and Women’s Initiative Coordinator for the TU NJ State Council. She also serves as the Diversity Initiative Workgroup chair. 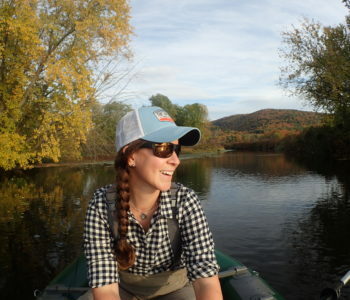 In addition, Kelly is the Board President of the Catskill Fly Fishing Center and Museum and a partner in Dette Flies, located in Livingston Manor, New York. When she’s not teaching literature, she is either tying classic wet flies or smiling in a stream somewhere in the Northeast, particularly the Catskills. I started my fly-fishing career targeting pike from a kayak on the rivers of East Anglia, England, where I guide part-time for these awesome predators. 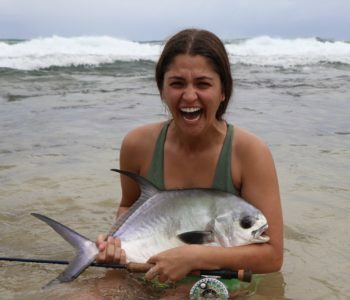 I also love saltwater fly fishing,and I’m fortunate to host trips to destinations such as Christmas Island. I am an avid fly tier and demonstrate at various shows throughout the UK. I spent two seasons managing an Atlantic-salmon lodge in northern Norway, where I looked after our guests’ every need, but also had plenty of time trying to land my own Norwegian giant! I currently still hold the Norwegian record for fly caught Atlantic halibut at 44kg (97 pounds). Over the next few years, I hope to start working toward my instructor’s qualifications in both casting and fly tying. Amidea Daniel was taught to love the outdoors wan early age, as she grew up fishing, hunting, camping, and exploring the natural world of the Pennsylvania Wilds. Ultimately, her passion led to a degree in Outdoor Resource Management from Lock Haven University, which eventually guided her to a position with the PA Fish and Boat Commission, where she’s applied my skills since 2008 as an outreach and education specialist and Trout in the Classroom coordinator. I also serve as the PFBC’s Youth and Women’s Program Coordinator. In this position, I work closely with PA Council of Trout Unlimited as a Co-Chair with Kelly Williams for their Women and Diversity Committee. 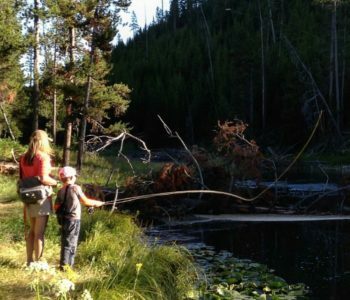 Fly fishing is a catalyst to explore nature with my husband and two children. I enjoy connecting people to nature, whether it’s through educational programs like Trout in the Classroom, or through recreational programs like fishing. 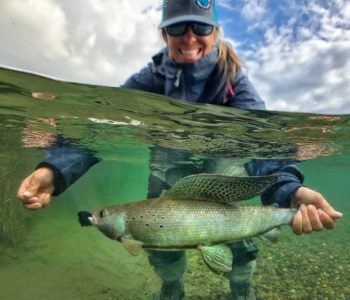 It’s fun to see the excitement of a TIC student when they release trout they’ve raised into local streams or the thrill when female anglers throw that first solid cast. We want to expand those opportunities through more tailored programs. Reaching out and gaining new female instructors/ ambassadors is the only way to continue to expand, not only the excitement and reconnection to oneself and others, but also to help protect our resources for generations to come.